After getting bowled out for 250 from 88 overs on the very first ball of the morning session, the Aussies made it upto 57 in 27 overs losing opener Finch early followed by Marcus Harris. 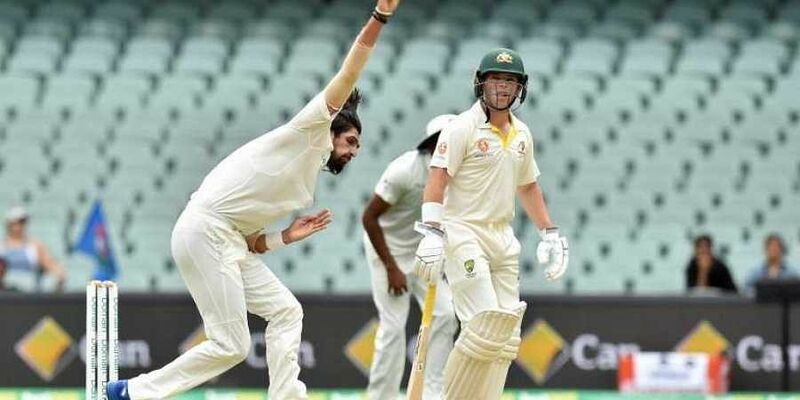 ADELAIDE: Australia made a slow but steady start to reach 57 for 2 from 27 overs at lunch on day two of the first Test against India here on Friday. This was after India were bowled out for 250 from 88 overs on the very first ball of the morning session. Mohammed Shami (6) showed no patience at all, and went after a short delivery from Josh Hazlewood (3/52) only to be caught behind down leg side, as India's first innings came to a quick end. Mitchell Starc (2/63), Pat Cummins (2/49) and Nathan Lyon (2/83) finished with two wickets each. It was a hectic start to the day's play, but Khawaja and debutant opener Marcus Harris (26) settled down to provide a solid start for the hosts. The duo batted out 20.4 overs and put on 45 runs for the second wicket, already higher than any partnership for the top-four Indian wickets. Indian pacers bowled with fiery pace, with Jasprit Bumrah (0/24) even breaching the 150km/hr mark at one point. However, they bowled short of good length on most occasions and did not make the Australian batsmen play too many deliveries. For their part, both Harris and Khawaja were content with leaving as many deliveries as possible and struck only four boundaries between them. Ravichandran Ashwin (1/15) was introduced into the attack in the 12th over of the innings and immediately hit up an interesting duel with Harris. The cover drive came out against the spinner, expectedly as a few more runs started flowing. Mostly they came off Bumrah, who erred in line and length. Even Mohammed Shami (0/1) bowled a tad short of length as the batsmen contended him with ease. Shami though bowled only four overs in the session, and even called on the physio at one point, to look at his bowling hand for cramps. He was off the field for three overs thereafter but word from team management is that he is fully fit. Even so, he did not bowl again in the session. Ashwin then struck before lunch. Harris played on to his pads and was caught at silly point in the 22nd over, as the spinner got dividends for blocking all scoring opportunities. Australia's 50 came up in the 27th over thereafter. On day one, Cheteshwar Pujara's (123) 16th Test hundred saved India the blushes, after they were reduced to 86-5 at one stage.